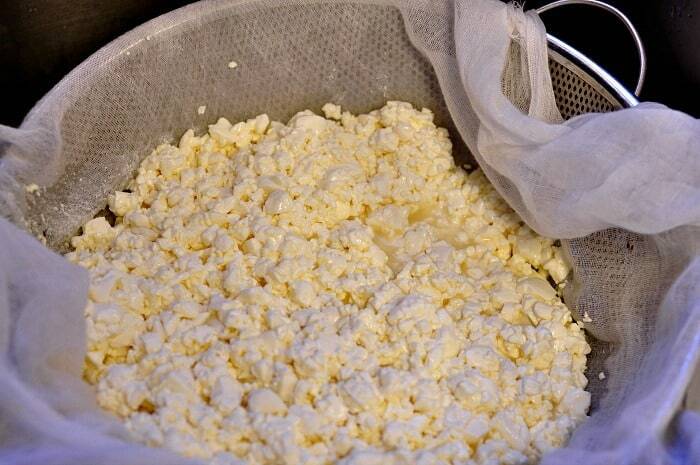 Learn how to make feta cheese at home. This delicious feta cheese recipe is very simple to make. It is a great cheese to start with when first beginning to make cheese. Serve this cheese with many meals including salads, braised stews and appetizer trays. This is just one of the recipes included in my Simple Cheesemaking ebook. Follow the link to find more wonderful cheese recipes with easy to follow instructions! I say, “Feta Cheese” – you say ____. If you had asked me years ago what the first thing that came to mind upon hearing “Feta Cheese”, I would have said, “smelly goat cheese”. What do you think of when you think of feta cheese? To some degree, those old thoughts about feta cheese are true. But, there is more to Feta Cheese than just being smelly goat cheese! When I decided to find a feta cheese recipe, I did some research about feta cheese. Did you know that it is traditionally made from sheep’s milk (or a mixture of sheep and goat’s milk). 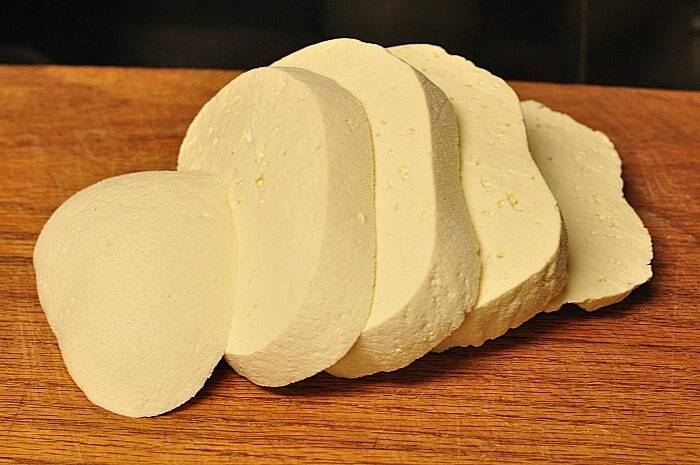 Also, it is commonly considered a Mediterranean cheese and primarily a cheese of Greece. Feta is a brined cured cheese which means after making the cheese, it is soaked in a salt water brine solution until eaten. You might wonder why I wanted to learn how to make feta cheese and find a feta cheese recipe. When we got our first family milk cow, Buttercup, I had to learn very quickly to process all the raw milk she was so generously giving – which was from 4 – 8 gallons of milk per day! We had moved from Alabama to west Texas to start our vineyard and it was our first year after planting the grapevines. 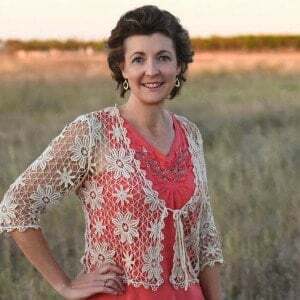 Knowing that we still had 2 more years before getting a grape harvest and living on savings – frugality became very important! Besides wanting a milk cow, I figured it all out and believe it or not, feed and hay for a cow was less expensive than the dairy products I was buying. And, that is not even taking into account the better quality and quantity! Now, that we have moved to our own land and have a pasture for the cows (we don’t have to buy hay anymore! ), a family milk cow is even more economical. As I began learning to make cheese, all sources seemed to say the same thing – begin with soft cheeses. And, feta cheese is a soft cheese. Soft cheeses usually require very little equipment, they are quick and easy to make, can be eaten fresh and require little or no aging. That is why trying a feta cheese recipe seemed logical. Now, with Toasted Pecan, Feta and Raisin Salad one of our favorite salads, this feta cheese recipe is even more important. 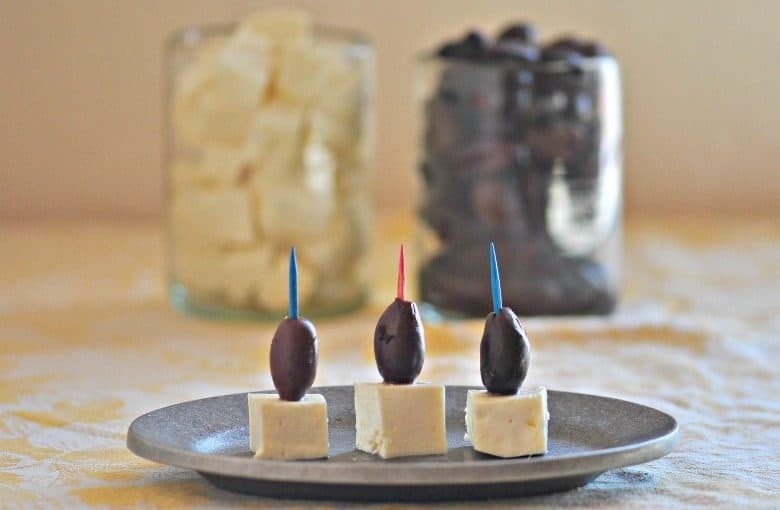 And, the little appetizers in the photo above are so easy to make – put an kalamata olive on a toothpick followed by a cube of feta cheese and voila! Knowing how easy feta cheese is to make, I could not bear to buy it. So, I want to share with you just how easy making feta cheese in your home actually is but, before you get started, be sure to check out Cheese Making Basics for tips, supplies and ordering information. First, here is the feta cheese recipe with photos inserted to show you how I do it and at the end is a printable version. Remove the milk from heat and add the starter and stir to combine. Cover and allow to stand for 1 hour. Wrap a towel around the pot to help maintain the temperature. Add the diluted rennet stirring gently to mix thoroughly. Cover and allow to stand for 1 hour. Keep the towel around the pot to maintain the temperature at 86 F.
Cut the curd into 1/2 inch cubes and allow to set for 15 minutes. 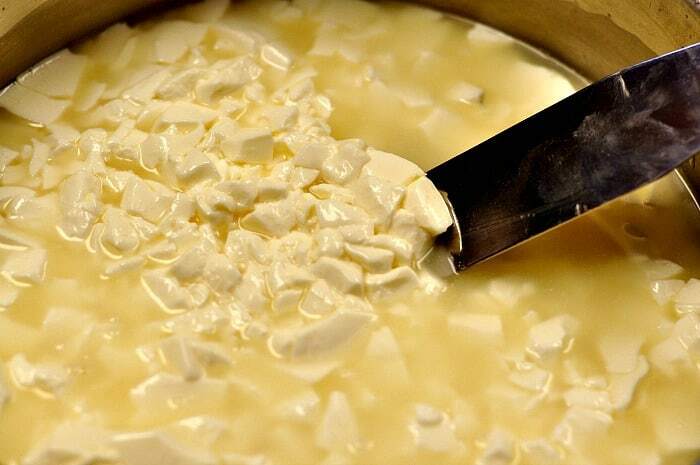 Gently stir the curd for 15 minutes – this helps expel the whey from the curds. As you stir you will notice the curd getting smaller. Pour the curds into a cheesecloth lined colander. Gather the corners of the cheesecloth and tie in a knot to hang the bag to drain. Using a long wooden spoon, I tie the cheesecloth around the spoon and suspend it over a 5-gallon pot to drain. This way I can cover and move the pot to a convenient location in the kitchen. Drain for 4 hours – I have gone as long as 6 hours because I got busy and forgot! Untie the cheesecloth and place the curd on a cutting board. At this point it will be a ball of curds. Cut the curds in 1 inch slabs. Cut the slabs in 1 inch cubes. 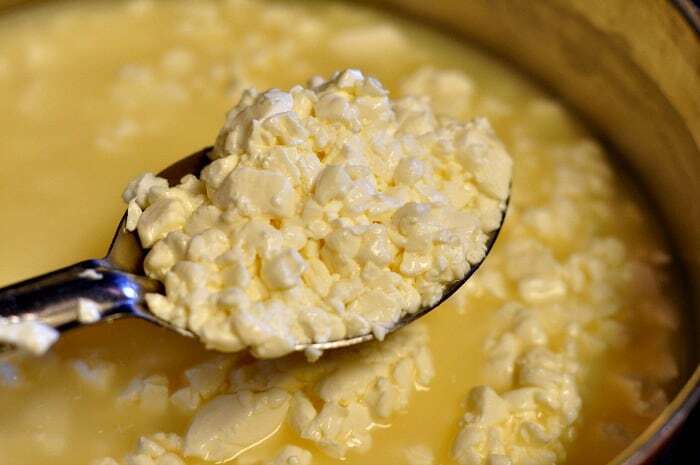 #1 – Place curds in a bowl and sprinkle 2 Tbsp of salt over them, stir gently, cover and refrigerate for 4 -5 days to age. #2 – Make a salt brine using 1/3 cup salt in 1/2 gallon of water. 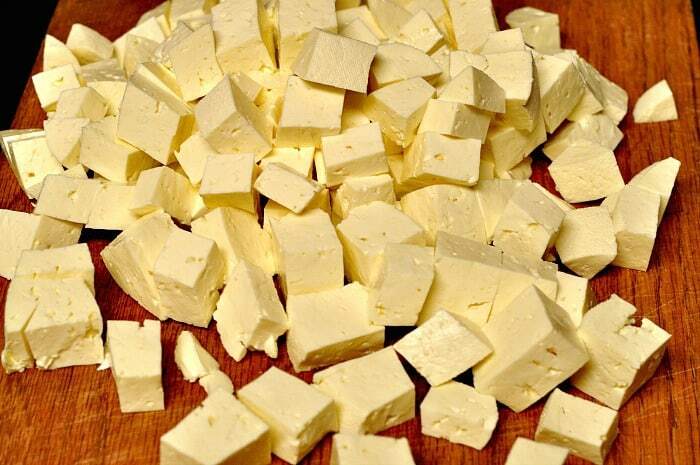 Place feta cheese cubes in the brine and place in the refrigerator, covered for 4 – 5 days. The feta cheese can be kept in the refrigerator in the brine for several weeks and will be stronger in flavor using this method. I have done both methods and really can’t say which I prefer – they are both very good! The homemade feta cheese soaked in a salt brine is wetter whereas the salted feta cheese is dryer. I guess it depends upon my final plan for the feta cheese – if I want it spreadable or plan to keep in the refrigerator for a couple of weeks, I prefer the brine method. If I will be using it quickly as in Toasted Pecan, Feta and Raisin Salad, I prefer to just salt the feta. 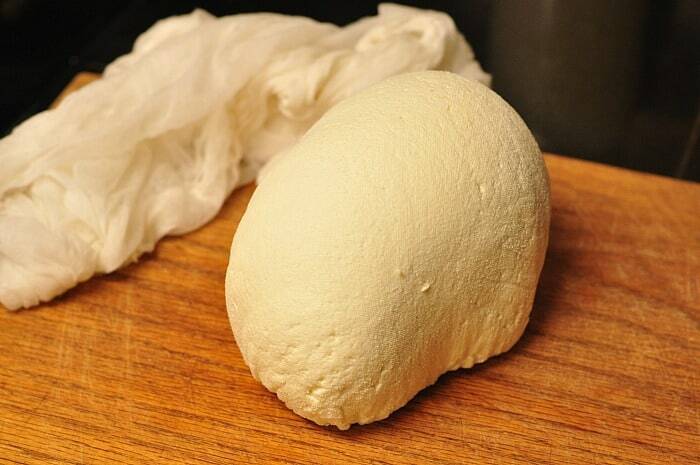 Another cheese you might be interested in trying your hand at is Mozzarella! 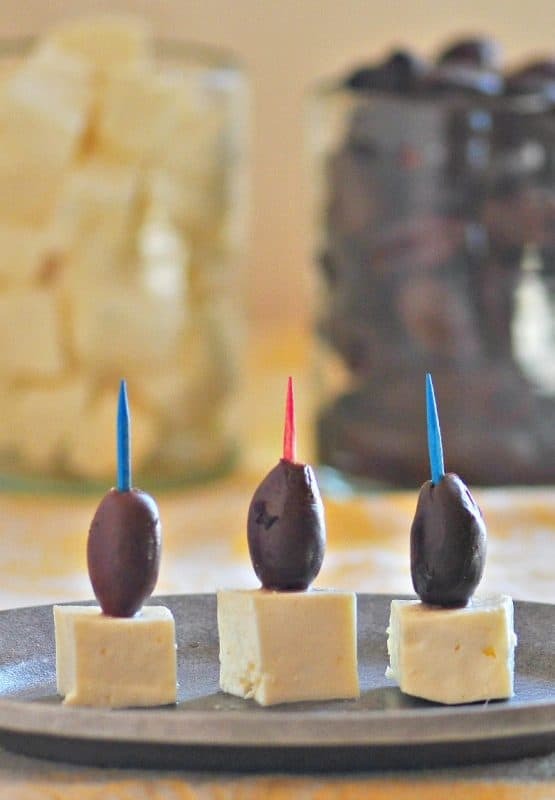 IF you’ve tried this Feta Cheese Recipe for how to make feta cheese or any other recipe on Cultured Palate please take a minute to rate the recipe and leave a comment letting me know how you liked it. I love hearing from you! You can also FOLLOW ME on PINTEREST, FACEBOOK, INSTAGRAM, YouTube and TWITTER. Feta Cheese is an easy cheese to make yourself and has a wonderful flavor achieved by a salt brine. Mix the milk and diluted lipase powder. 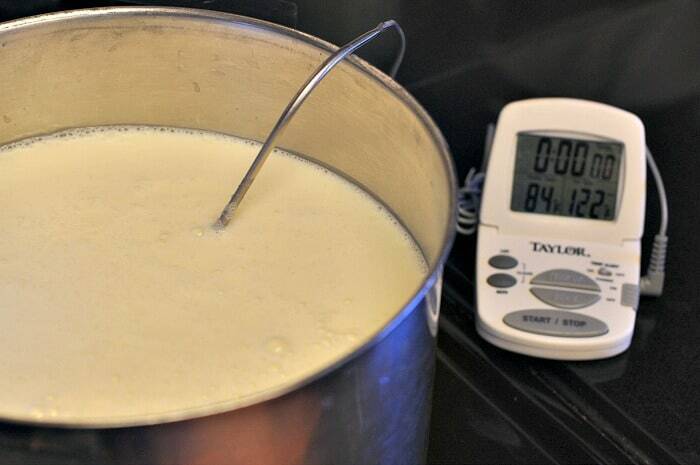 Heat the milk to 86 F.
Gently stir the curd for 15 minutes - this helps expel the whey from the curds. As you stir you will notice the curd getting smaller. Pour the curds in Pour the curds into a cheesecloth lined colander. Gather the corners of the cheesecloth and tie in a knot to hang the bag to drain. 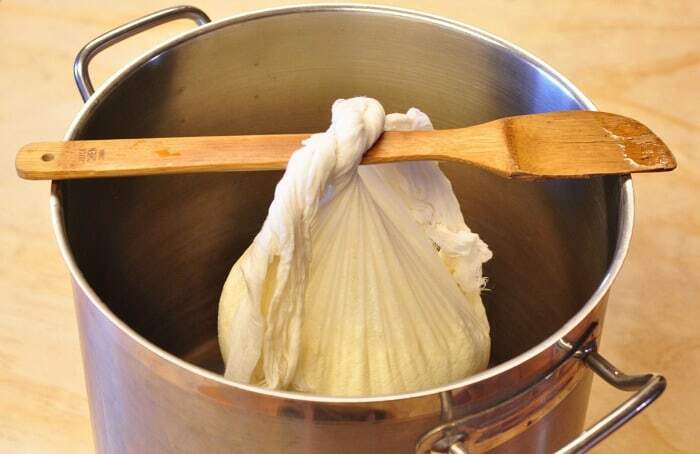 Using a long wooden spoon, I tie the cheesecloth around the spoon and suspend it over a 5 gallon pot to drain. This way I can cover and move the pot to a convenient location in the kitchen. Drain for 4 hours - I have gone as long as 6 hours because I got busy and forgot! 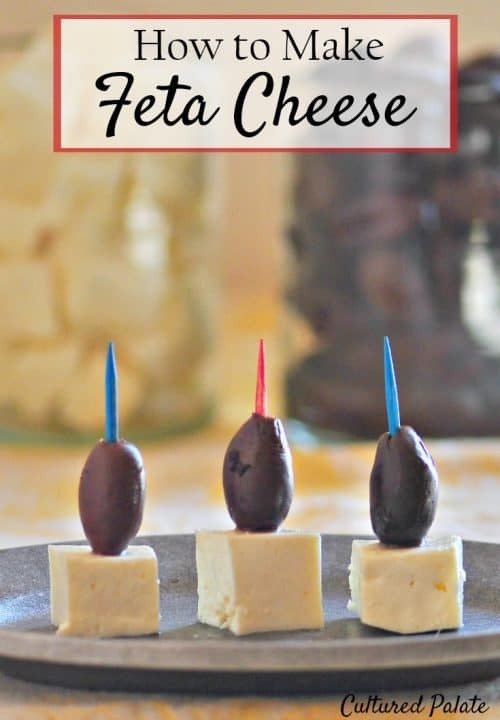 To finish the cheese and age it there are 2 options:#1 - Place curds in a bowl and sprinkle 2 Tbsp of salt over them, stir gently, cover and refrigerate for 4 -5 days to age.#2 - Make a salt brine using 1/3 cup salt in 1/2 gallon of water. 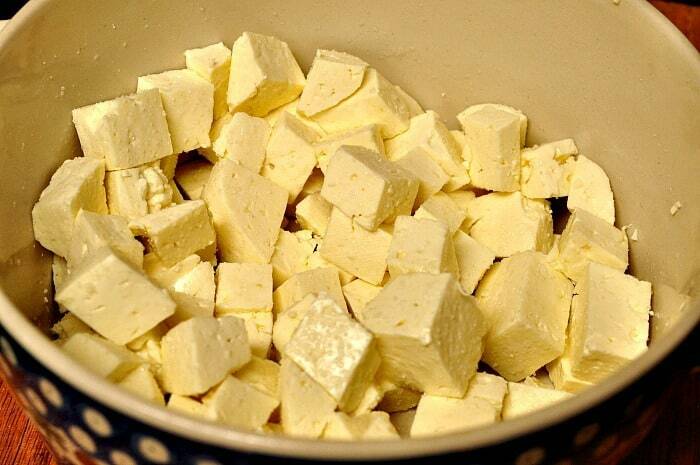 Place feta cheese cubes in the brine and place in the refrigerator, covered for 4 - 5 days. 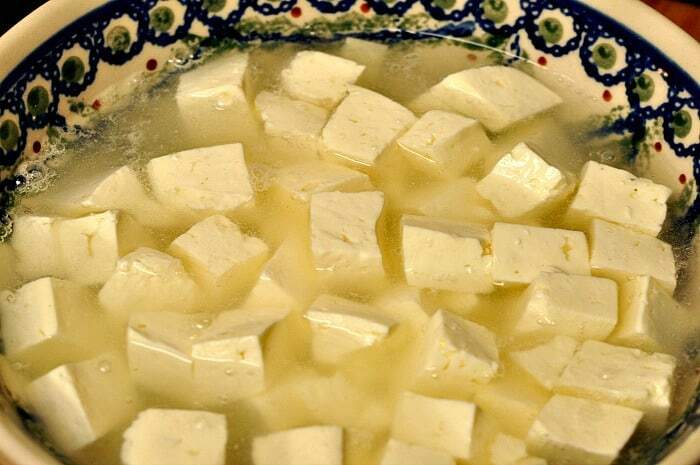 The feta cheese can be kept in the refrigerator in the brine for several weeks and will be stronger in flavor using this method. Which method to choose for finishing the feta? I have done both methods to finish the cheese and really can't say which I prefer - they are both very good! The feta cheese soaked in a salt brine is wetter whereas the salted feta cheese is dryer - I guess it depends upon my final plan for the feta cheese - if I want it spreadable or plan to keep in the refrigerator for a couple of weeks, I prefer the brine method. Thanks for sharing this on the Homestead Bloggers Network round up – this looks amazing! The appetizer, and the tutorial too. Very awesome! Feta is my favourite cheese for salads, I just love it! I definitely need to try making my own, thanks for this! You are welcome, Emily and I hope you enjoy it!